45 years ago on Monday I first witnessed the pure live power of Led Zeppelin when I attended the second Electric Magic show at the Empire Pool Wembley on the evening of Sunday November 21st 1971. I was just 15 years old –the effect would be a lasting one. Looking back one of the things that stands out from that time is that Zep had a ‘’leaders of the underground’’ stigma about them. 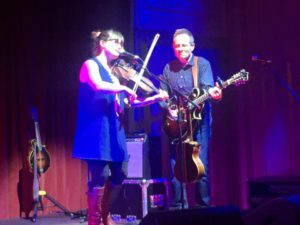 This was the night Home and Stone The Crows were the support acts and during both sets their respective guitarists took out a violin bow and briefly did a ‘’Jimmy’’ in mock respect for what would occur later. The in between entertainment was provided by the infamous performing pigs that didn’t and the plate spinner Olley Gray who also didn’t fare too well. Warm up records played by DJ Jeff Dexter included Redbone’s Witch Queen Of New Orleans and Isaac Hayes’ Shaft – both hits of the time (Page would insert the riff of Shaft into their version of Dazed And Confused the next week in Manchester. 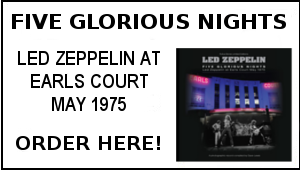 Ultimately it was that night back in November 1971 that sparked the insatiable belief in their music that has stayed with me ever since. It was a night of true Electric Magic and the intervening 45 years have done nothing to diminish its impact. Back then at 15 years old, I knew I had witnessed something very special –but little did I realize that 45 years hence at aged 60, Led Zeppelin would still mean so much to me and countless millions across the world. Dave Lewis – November 17, 2016. For legions of rock fans the world over, the song Stairway To Heaven is the greatest ever recorded. The album it came from was released this week 45 years ago and, indeed on this day in 1971, the band that recorded it began their UK tour at Newcastle City Hall. The early 1970s was a golden era for rock music, with the likes of Pink Floyd, the Rolling Stones, The Who, David Bowie, Elton John and other stellar names all performing in the region. By late 1971, the biggest rock band in the world, however, was Led Zeppelin who had supplanted the now-defunct Beatles in that position a year earlier. The irony was the English group, who’d actually made their first UK performance at Newcastle Mayfair in October 1968, refused to release singles, rarely gave press interviews, and wouldn’t do television. They never appeared on Top of the Pops, despite the show using a version of one of their songs – Whole Lotta Love – as its theme tune for many years. Today, this PR approach would mean commercial suicide. Back then it gave Led Zeppelin a mystique which set them apart from their rivals. 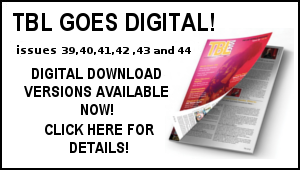 Author Dave Lewis, the world’s leading authority on the band runs the popular Tight But Loose magazine and website. Dave said: “Led Zep had a strong affinity for performing in the North East. This date was the first night of a 16-date UK tour. “It saw them showcase material from their much anticipated fourth album. It was the first time a UK audience would have seen their new stage set-up with Jimmy Page’s amplifier emblazoned with his ‘Zoso’ symbol – one of the four that made up the mysterious title of the album. An audience recording of the City Hall show exists on a bootleg and captures the excitement of the crowd and the power of the band. 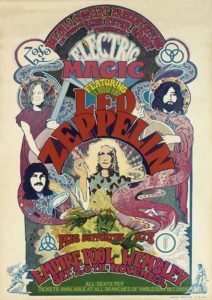 Opening with the Immigrant Song, singer Robert Plant, guitarist Jimmy Page, drummer John Bonham, and bassist/keyboardist John Paul Jones, show why their sound was packing out arenas in the United States and around the world. It would go straight to number one, but little would the audience know the album would go on to become one of the best selling of all time, with estimated sales – to date – of 37 million. 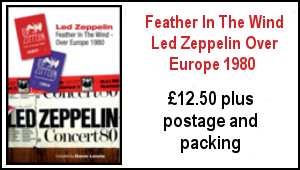 To mark the 45th anniversary of the release of Led Zeppelin IV here’s a TBL archive feature – first compiled for TBL issue 15 though not used at the time – it eventually appeared in the my Celebration II – The Tight But Loose Files book. On the evening of Saturday, September 19, 1970, the four members of Led Zeppelin took a final bow before leaving the stage of New York’s Madison Square Garden. It signalled the end of a massively successful US tour, their two performances at the Garden alone netting each of them around $30,000 – not bad for six hours work. Their second album had been a fixture on the album charts on both sides of the Atlantic, racking up sales of over a million in both territories. The previous June the group’s bill topping appearance at the Bath Festival had cemented their reputation on home soil. Readers of the then hugely influential Melody Maker had just voted them as the top act in their annual pop poll, ending years of dominance by The Beatles. There was simply no doubt about it. 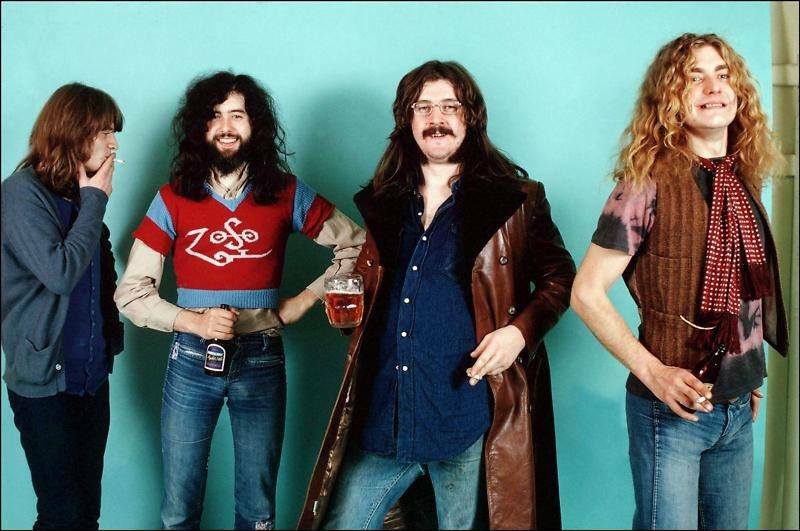 Led Zeppelin were now the biggest band in the world. In early October their eagerly awaited new album, Led Zeppelin III, hit the stores. Its bold agenda in combining the familiar, trademark heavy rock dynamics with more acoustic textures confused both the public and press alike. 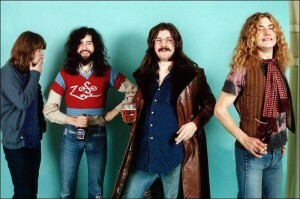 Headlines such as “I… 2… 3 Zep weaken” were rife as this new direction confused and, to some degree disappointed, critics. Aside from a day out in October to accept a clutch of gold discs from a Parliamentary Secretary for their part in sustaining the country’s healthy balance of exports, the group laid low. In late October Page and Plant returned to the idyllic cottage half way up a mountain in South Snowdonia known as Bron Yr Aur. 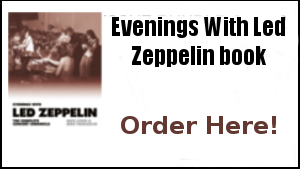 It was here that earlier in the year they had conceived many of the songs for Zep III. This return visit again found them ensconced around the open fire with acoustic guitars in hand preparing material for the next record. They already had a backlog of completed and work-in-progress ideas, amongst them a lilting, Neil Young-influenced: titled ‘Down By The Seaside’, ‘Hey Hey What Can I Do’, a semi-acoustic country stomp and, in the same vein, a song called Poor Tom’. ‘The Rover’, then an acoustic idea with idealistic lyrics, was another song waiting to be honed. John Paul Jones had been working on a brooding keyboard piece that would later emerge as ‘No Quarter’, while Page had began demoing a lengthy instrumental track which started off tranquil but built to a crescendo. We all know how that idea flourished, initially they considered a double album, and Page even toyed with the bizarre idea of issuing the album as four separate EPs. After the Zep III backlash they were immensely keen to lay down some fresh new material. Headley Grange, a largely derelict 18th century manor house, was situated in deepest Hampshire. A three-storey stone structure built in 1795, it was once a workhouse known as Headley Poor for the aged and infirm, and in 1870 it was bought by builder Thomas Kemp who converted it to a private residence and. renamed it Headley Grange. In the wake of the ‘getting it together in the country’ trend that acts such as Traffic had pioneered in the late Sixties, the place began to be used as a rehearsal venue for the likes of Fleetwood Mac and Genesis. It was Fleetwood Mac who suggested the premises to Page. 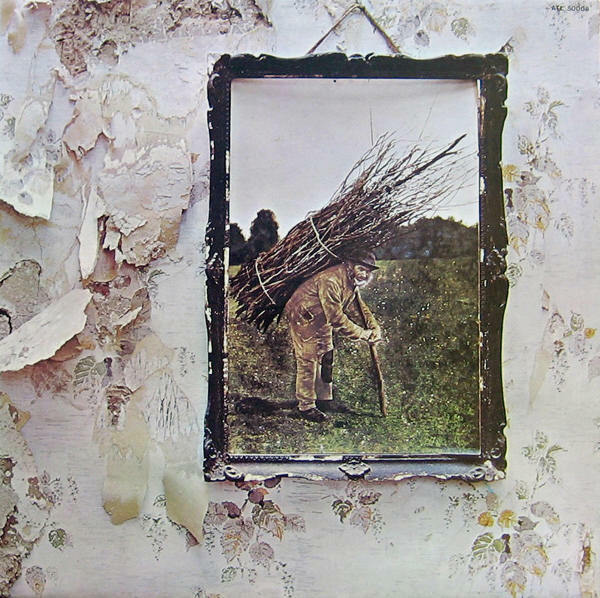 So on a cold January morning early in 1971, accompanied by a handful of roadies plus engineer Andy Johns (brother of noted producer Glyn Jones who had worked on the first Zeppelin album), Page, Plant, Jones and Bonham convened on the old workhouse to set up and record material for their fourth album. Parked outside was the Stones’ mobile studio looking not unlike some vintage army intelligence unit. Engineer Andy Johns recalled the idea behind going there in an interview with Guitar World: “I had just done Sticky Fingers with the Stones and we’d used the mobile truck on that. So I believe 1 suggested using the truck to Jimmy. We had used Mick’s house at Stargroves but Jimmy didn’t want to stay there because Mick wanted too much money. Then Jimmy found this old mansion so we brought the truck there.” They did eventually record at Stargroves the following year for the Houses Of The Holy album. On hand to monitor the recordings was Ian Stewart. Stu, as he was affectionately known, was a long time backroom associate of The Rolling Stones – and had even been in an early line up of the group prior to Andrew Oldham grooming the younger band members for success. Stu was an accomplished jazz and blues pianist, and his battered old upright piano was packed alongside the Zep gear in preparation for the likelihood of a jam session or two. The relaxed nature of the whole set up deemed this inevitable. Jimmy Page attended the Classic Rock Awards in Tokyo, Japan on November 11. 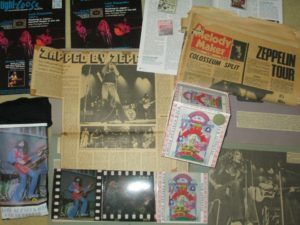 Posters and promotional material released by Classic Rock Magazine and the promoters made it seem as if Jimmy Page would perform alongside Jeff Beck and other performers, or at least participate in a jam session. But it wasn’t to be — Page presented Jeff Beck with an award around 10pm. There was a rehearsal and photoshoot on November 9, which Page was photographed at. He posed for photos with Stone Temple Pilots and Hollywood Vampires bass player Robert DeLeo, Korn drummer Ray Luzier, and radio presenter Nicky Horne. Page also recorded a video to promote Japanese publication The Rock Club’s special issue. Before the event on November 11, Page watched Jeff Beck soundcheck, and he can be seen sitting next to Aerosmith guitarist Joe Perry in a photo. After the awards Page went to a dinner with the headliners. You can see all of our coverage of Jimmy Page in Japan here, scroll up to see the previous tweets. Jimmy Page gave an interview to Rolling Stone Japan, which you can read here (if you can read Japanese, that is). There were also two new photos of Page taken for the interview. Page said during the interview that he intends to focus on his “guitar project” next year, and he also said that he would have supported Bernie Sanders if he were a US citizen because Sanders got young people involved in politics. Page previously supported the Conservative Party in the UK, and said in an interview with NME in its August 4,1979 issue that he voted for the Conservative Party that year. Below is the press release for Australia’s extremely successful concert event ‘Stairway To Heaven: Led Zeppelin Masters’. The tour arrives in the UK for the first time in April 2017. Long time TBL Australian subscriber Michael Rae strongly recommends this show. Tickets go on sale on Friday, 18th November. 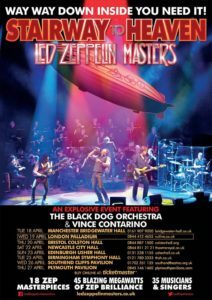 Stairway To Heaven: Led Zeppelin Masters will crash the UK with a limited eight-date UK #tour in April 2017! 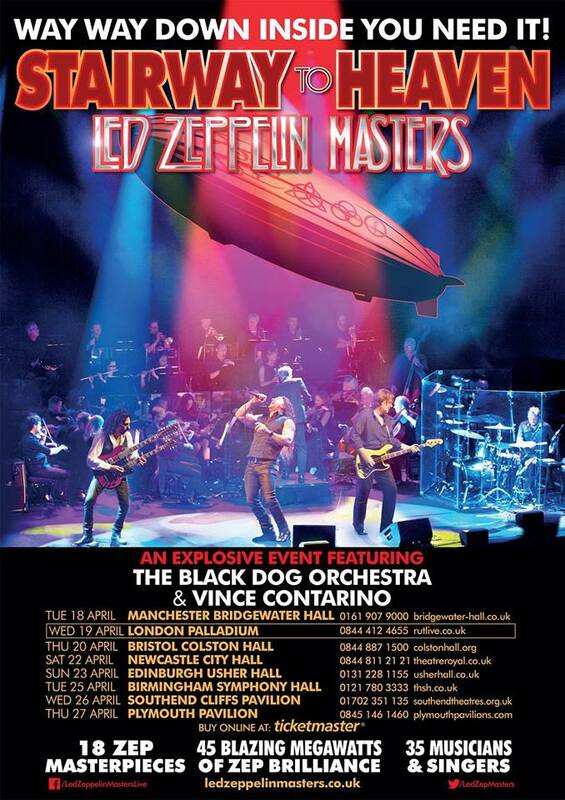 Fronted by powerhouse vocalist Vince Contarino and bolstered by the breathtaking might of the thirty-five-piece The Black Dog Orchestra, Led Zeppelin Masters is one of the most ambitious concerts ever to meet the stage. TICKETS ON SALE FRIDAY 18th NOVEMBER! Way, way down inside, you need it! 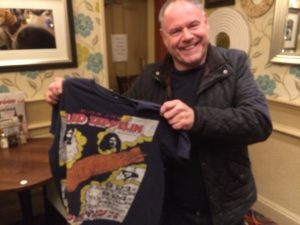 Luke and Guy played in various bands in Bedford during the 80s and early 90s and during my time writing a column for the local Bedford newspaper the Beds Times Citizen I covered some of their early gigs – it was Luke’s way of saying thanks – how nice is that! Friday treats at the Vinyl Barn – some single delights last Friday including Atomic Rooster Devils Answer in pic sleeve, Jethro Tull Witches Promise/Teacher in pic sleeve plus America by The Nice and The Small Faces Tin Soldier on the Immediate label- seven inch beauties – thanks Darren. 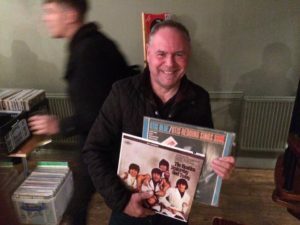 On Saturday, there were some very nice finds at the Bedford Pop Up shop – including Otis Redding Otis Blue on the US Volt label and The Beatles Yesterday and Today album on coloured vinyl, not quite original but very nice to have! I was also well pleased to find the man From UNCLE soundtrack album – actor Robert Vaughn was another sad passing last week. In the evening we attended Michaela Tait’s 50th birthday party in Bletchley. 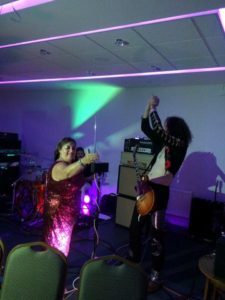 A great night with Zep tribute band Coda turning in a highly entertaining set. Here’s the birthday girl adding a bit of theremin to a stomping Whole Lotta Love! You rock at 50 Mrs Tait! It’s been another week of intensive work on TBL 42. A fair bit of text has slotted in but there’s a way to go yet. Health wise – still not been feeling great to be honest – the anxiety attacks are still causing some distress and I’m trying to keep a positive attitude on dealing with various stuff that has led to that situation. On the player: Robert Plant Fate Of Nations, Bob Dylan Blood On The Tracks ( what a record) and Phil Collins Face Value. The latter artist may be much maligned but that album still sounds very impressive and the themes of love and loss still resonate. For all the Live Aid controversy, I have a lot of time for old Phil – a great drummer (his work on Robert’s Pictures At Eleven is exemplary) and I’ve just started reading his just published autobiography, he tells it like it is – it’s a very honest account. He has certainly had his problems but I am glad he is back to form and judging by the very buoyant ticket sales of next year’s comeback gigs, his reputation is back on the up. Dec was coming over for Phil’s party back from Ireland and having booked early is still making the trip and it will be good to see him. The VIP Olympia Music Mania Record Fair is also upon us this weekend and I am aiming to be there Saturday. It’s the biggest fair of the year and the presence of several US and overseas dealers always makes it a very worthwhile and interesting event. More on all that and progress on the forthcoming TBL 42 next week. 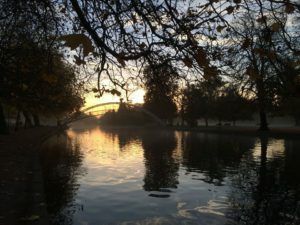 Dave Lewis – November 17 , 2016. Dave… Where do you find room for all this stuff…!?! Did you have an extension built to house your LP collection…!?! I recently purchased the incredible 27-disc Pink Floyd Early Years box set and that alone feels like it occupies one quarter of my entire living space. I saw Jimmy Page at Newcastle City Hall on Nov 23rd 1988 as a 16-year old (my first ever concert) and I relate entirely to your sentiments. My ears are still ringing.